Seniors without family support can soon turn to social workers to help manage their finances if they lose the ability to make decisions for themselves. The Ministry of Social and Family Development (MSF) has introduced the Community Kin Service pilot project, where social workers with voluntary welfare organisations (VWOs) may apply to the Family Justice Courts for powers to manage the finances of seniors under their care. The courts will then approve regular payments for the seniors' healthcare needs and household expenses, with MSF backing such court applications. Minister for Social and Family Development Desmond Lee said yesterday: "The Community Kin Service allows VWOs to help fill the role that a next of kin would typically play in supporting a senior." The MSF said in a statement that the pilot project will cover seniors who are 60 and above, have no family support and show signs of a declining ability to make decisions for themselves. Two VWOs - TOUCH Community Services and AMKFSC Community Services - have been chosen for the pilot that starts early next year. The MSF was unable to say how many seniors could potentially benefit from the scheme. TOUCH said about 350 of the 7,000 seniors under its care are gradually losing the ability to make decisions for themselves, while AMKFSC estimated that 100 of the 1,000 seniors under its care may have dementia. Ms Julia Lee, senior director at TOUCH, said the new scheme is an extension of what the VWO's social workers are already doing to help the seniors under their care. "The social workers now take care of the seniors' medical and social needs. Some of the seniors also turned to us for help in managing their finances," she said. "But currently we cannot do that because we are not authorised to do so." Mr Ng Koon Sing, head of senior services at AMKFSC Community Services, said the process of applying for the court order needs to be simplified for VWOs. "The MSF is talking to the courts on how the process (of court applications) can be more streamlined. Our objective is not to create more work," he said. Minister Lee, who was speaking at the first Asian Family Conference held at Orchard Hotel, said the ministry will run the pilot for "a year or two" before deciding whether to expand it. "As a safeguard, VWOs must provide annual reports to the Office of the Public Guardian (OPG) to account for the use of funds," he added. The OPG, which comes under the MSF, runs the Lasting Power of Attorney Scheme under the Mental Capacity Act, which lets people appoint a "donee" or "deputy" in advance to take care of legal decisions should they lose their mental ability to do so. Every two months, Madam Cheong Siew Keng makes a trip to an ATM in the Geylang Bahru neighbourhood where she lives. 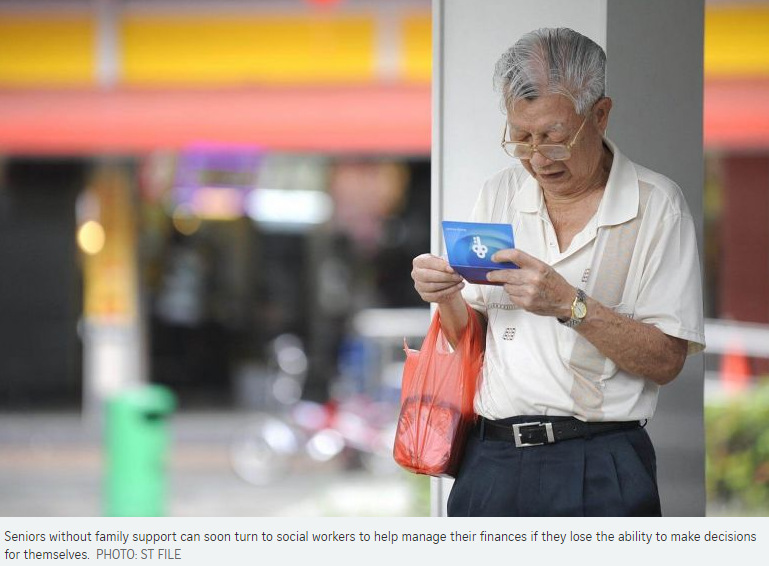 "I will withdraw $500 each time for household expenses," says the 85-year-old. She will ask a staff member from the TOUCH Senior Activity Centre, which runs a branch at the void deck of her Housing Board flat, to accompany her to make sure that she punches in the correct PIN. "I trust them," says Madam Cheong. It is the same drill when she has to visit the doctor - she will tell the staff at the TOUCH centre that she is ill and ask that they accompany her to the clinic. "I have lived here for 18 years. The last 15 years I lived alone after my husband died," says Madam Cheong. "I don't have any children. The people at TOUCH are like my family members." From next year, she will be able to turn to the voluntary welfare organisation for a new service. Should she lose the ability to make financial decisions for herself, TOUCH will be able to manage her finances on her behalf, by getting court approval to withdraw money from her bank savings for her healthcare and household expenses. While Madam Cheong may be living alone in an HDB rental flat, she does not receive public assistance and instead relies on her savings of more than $10,000. "My husband was working as a goldsmith and I was a housemaid, so we have some savings," says the sprightly woman. 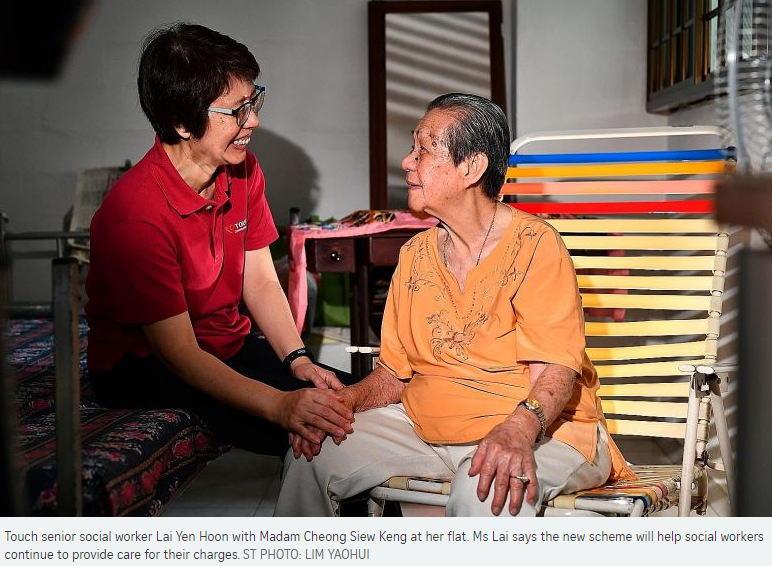 TOUCH senior social worker Lai Yen Hoon, who has cared for Madam Cheong for more than two years, says the new scheme will help social workers continue to provide care for their charges. "Many of the seniors trust us to take care of them and the trust is built over many years. The new scheme is another way that we can continue to care for them," she says. Meanwhile, Madam Cheong says that while she may be healthy now, her health and memory will eventually fail. "I don't think about it... But when it happens, I know that I will not be alone." The professionals hired by seniors to manage their affairs when they lose the ability to take care of themselves will soon face stricter rules. Minister for Social and Family Development Desmond Lee said yesterday that these paid professionals cannot be undischarged bankrupts, people convicted of serious crimes, or those who were involved in civil suits like breach of trust. He added that his ministry, which is working on a registration scheme for these professionals, has decided to impose these new criteria "as an added layer of protection". The paid professional scheme was announced by the ministry in December 2015 when it said it was seeking to amend the Mental Capacity Act. This would allow seniors without family or close friends to turn to paid professionals to act as their donees and deputies. Parliament passed the amendments in March last year. But while the law that paved the way for the scheme was passed nearly two years ago, Mr Lee said yesterday that the ministry is still working out its details, including the registration of professional deputies. In response to queries on when the scheme would be ready, the ministry told The Straits Times last night that the certification course is an important component of the framework, to ensure potential professional deputies and donees are knowledgeable about their responsibilities and trained to carry them out in the seniors' best interests. More details of the scheme will be given "in due course", it added. In his speech, Mr Lee said his ministry is working with the Singapore University of Social Sciences to develop a training programme for such professionals. They cannot be related to the seniors and are likely to be lawyers, accountants, and healthcare and social service professionals, he added.